ATEN, established in 1979, is specialised in connectivity and management solutions in accessing and sharing technologies. 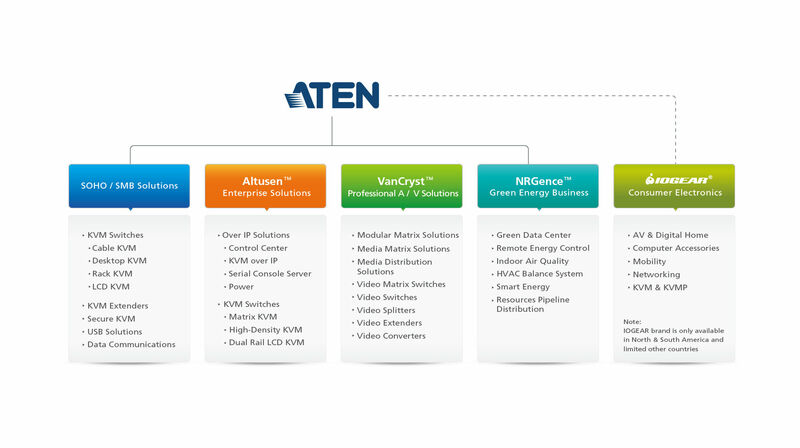 ATEN consolidates all of its products and services under one brand – ATEN, in order to provide an efficient and consistent service standard. The ATEN brand consists of innovative solutions applied to connectivity, professional audio/video for small- to medium-sized businesses (SMB), and enterprise customers. The Professional Audio / Video line offers integrated video solutions for home and professional use for a variety of uses including corporate, education, hospitality, commercial and home theater applications.